How determined was Margarita Aguirre to one day work at HKS? So much so that when she was an architectural graduate student at the University of Texas at Arlington, she supported herself by working not one, not two but three part-time jobs at buildings designed by HKS. A huge Dallas sports fan, Margarita worked as a tour guide at AT&T Stadium and as an usher at Globe Life Park in Arlington and the American Airlines Center in Dallas. Even now, three years after becoming a full-time architectural designer for the firm, she still holds one of those jobs. Margarita remains an usher, or rather, customer service representative, at Globe Life Park. 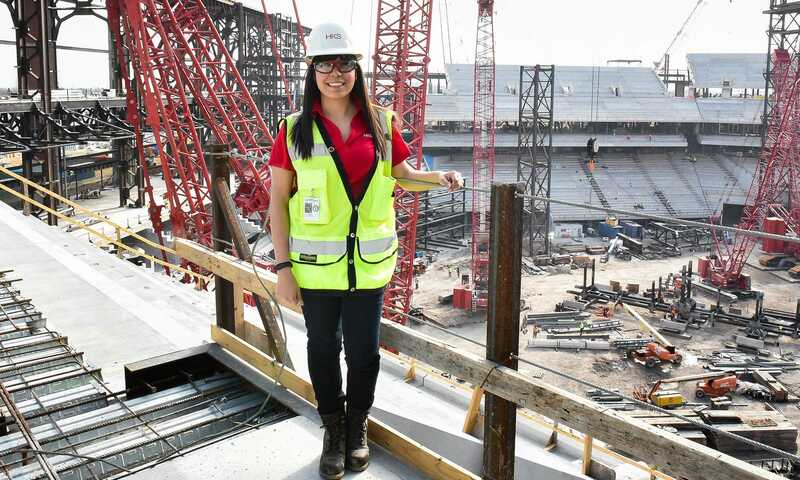 So, while by night she helps Texas Rangers fans to their seats, by day she’s one of the project members specifically assigned to work on the Rangers new $1 billion home, HKS-designed Globe Life Field opening in 2020. Margarita is a strong believer in fate, and it seems she was destined to work at HKS. Her architectural journey began at age 10 when she and her family visited an aunt in El Salvador. The aunt — actually her mother’s cousin who is close to Margarita’s immediate family — was an architect. Looking at her drawings and models, young Margarita quickly became enthralled by her work, and she wanted it to become hers. “It just struck me that I wanted to do this,” she said. Destiny intervened a few years later when Margarita was in middle school. She attended a summer camp where they randomly split the campers into groups for a field trip to various Dallas businesses. Margarita’s group wound up at HKS. She couldn’t believe her good fortune, but she was ecstatic. As the tour concluded, their guide — an architect — gave them her business card. For most of the youngsters, the gift was simply a piece of paper with a soon-to-be-forgotten name and phone number. But to Margarita it meant much more. It was a tangible confirmation of the vision that began in her aunt’s home. That business card became her beacon, motivating her through the long days and nights of schooling, inspiring her when she thought about giving up her dream, lifting her when her spirits were down. From that day forward, Margarita carried that business card everywhere. Even to her initial job interview at HKS in 2016, where she had an unexpected reunion with the architect who gave it to her, Jessica Mabry. Jessica said that she never thought of herself as a role model for other young women in architecture and is proud of her influence in Margarita’s career and of how the young designer is helping other youngsters pursue their dreams. The two are friends and Margarita even returned the favor and gave Jessica one of her business cards after she was hired. Unfortunately, the other strong influence in Margarita’s career, her aunt Mayra (pronounced My-ra) Ramirez, died during her final semester of graduate school. Her death was a devastating blow to Margarita, but it also made her more determined to reach her goal. She said her aunt’s indomitable spirit is still with her each day and helped her push to become part of the project team designing Globe Life Field. Margarita initially worked wherever she was needed on the stadium, her first major project since she obtained her master’s degree. She is currently serving as the BIM manager, helping to support and manage the digital technology on the project. 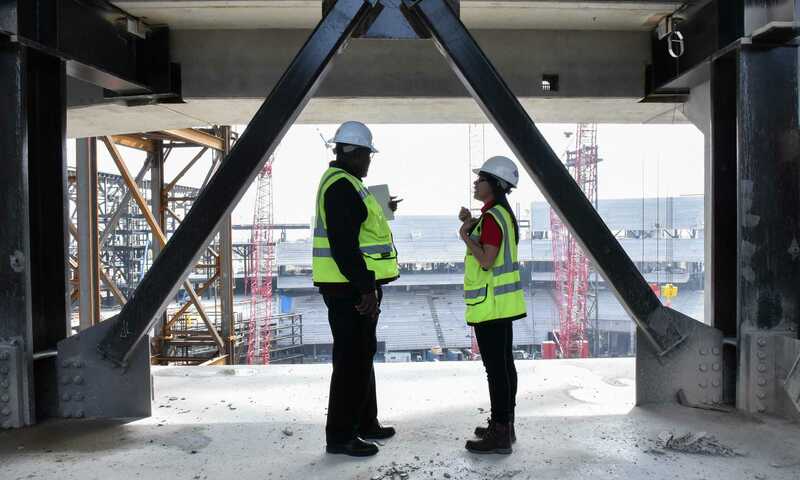 Her role means that from now until the project’s completion, she’ll spend most of her time at the construction site, learning more about the profession and the intricacies of the new stadium. But her day job won’t stop her from spending her seventh season as a Rangers usher. The idea of giving up working Section 209 never seriously crossed her mind, although she said she’s constantly quizzed about her moonlighting activities. Margarita’s unique perspective as an employee of both the Rangers and HKS has come in handy. In part because of her discussions with the project architects, they added three fully-apportioned break rooms for the ushers to the new stadium’s plans, a place of their own where they can eat, mingle and relax. But Margarita probably won’t get to enjoy those new breakrooms right away, at least not on Opening Day 2020. Instead, she’ll be at the new ballpark as a fan as she treats her parents, grandmother and younger brother, Nathan, who will soon become the family’s second college graduate. She said it’s the least she can do for them. Next spring will be quite busy for Margarita and her family. Just a few weeks after the new stadium opens, she plans to marry her longtime boyfriend before hundreds of relatives and friends. It will be just one more step in her magical journey and she’s proud that HKS has been a critical part of it.